BEETHOVEN'S HAIR traces the unlikely journey of a lock of hair cut from Beethoven's corpse and unravels the mystery of his tortured life and death. The film begins in modern times when a pair of Beethoven enthusiasts, Ira Brilliant and Dr. Alfredo "Che" Guevara, purchase the hair at a Sotheby's auction. As the story unfolds, it follows the past generations of owners, culminating in the futuristic science that reveals Beethoven's "medical secret". Set to a lush score of some of Beethoven's most glorious music, the film explores the world of forensic testing in sharp relief against the romance of 19th century Vienna and the horrors of 20th century Nazi Germany. Based on Russell Martin's bestselling book, this is the story of characters separated by time and place, whose only connection is an odd relic that touched each of their lives. Along the way, BEETHOVEN'S HAIR sheds new light upon the cause of Beethoven's various maladies, including his deafness, as well as accounting for his volatile personality and perhaps even the nature of his art. 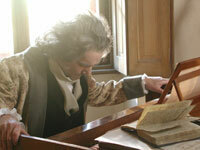 "Alternately quirky and poignant, Beethoven's Hair displays the exquisite edge of Weinstein's masterful storytelling." "Several rich strands are intertwined in Beethoven's Hair , a musical mystery tour starring a hard-traveling forelock from Ludwig Van. Side trips into the Holocaust, kitschy Americana, and up-to-the-minute science give breadth to this tale of musical obsession, which never loses sight of the genius that generates the action. This most recent feature from Larry Weinstein (who received a retroretro tribute at Hot Docs, drawn from the Rhombus Media founder's 20 pics in as many years) deserves noisy fanfare at music-minded fests...Beethoven's music, beautifully performed by musicians in the Czech Republic (where most of the nicely lit restagings took place) add to the drama, while deft sound design and editing add smooth textures across the board." "Told in a splendidly imaginative manner, the narrative moves through the intriguing milieu of Vienna in the 19th century, to the terrible drama of the Second World War, and right up to the world of contemporary science and a sort of CSI forensics plot. Even if you have zero interest in Beethoven, the true story of what happened to that lock of hair is way stranger than fiction." The great, but little known, 20th century composer, persecuted for his communism.